Sweet memories! I didn't think about posting at 09:09 09/09/09. :( Now I think I should have. 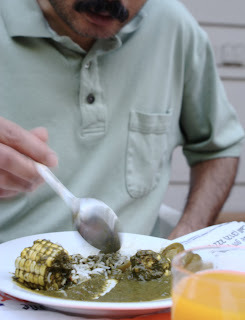 I like the palak and corn curry you've made. 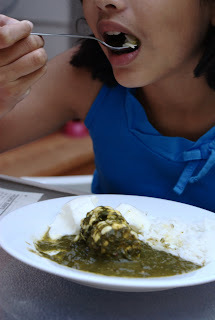 Never mixted tamarind with palak. Should try this the next time I get some.. 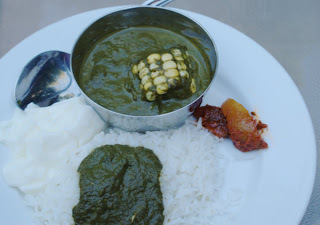 I remember having a corn curry years ago at an aunt's place. 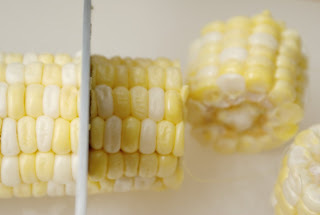 She cut up the cob just like you did. I used to love it. Reminds me that I should probably track that aunt down and ask her for the recipe. aww..manisha..!..that's a beautiful post..loved reading about your Dad. There have been many occasions, when a smell, a sight or even stranger's look transported me to past! !..I cringe thinking and trying to recreate..when it comes to dishes..of course Dad always says the dishes that we ate as kids, can never come back to life..maybe to do with the freshness of all things then..
whatever..its a beautiful event, hopefully I should be inspired to write something..
yes, after reading your msg..I was looking at the clock and as I said made a wish too..so my post was kind of delayed!..hehhe...lovely pictures of your family..cob looks delish! You know, I always wanted to do an event focusing on writing, but held back for various reasons - am curious to see the turnout. Have been planning one for my blogiversary, though it's quite different from this. Oh yeah, and I was wondering why the coconut hadn't made an appearance in the amti for a long time till I read further! Oh! I like this!!!! I like this!!!!!! an instant fave!!!!! Just kidding. Seriously, I really do like the idea for this event and I might just have something for you - something that came to my head instantly. I'll have to see what I can do with it. What a wonderful idea, Manisha. Nowadays, I am in a flashback mode, all too often. Might be able to send you something. And yes, I loved reading about your memories too. But, seriously, I am looking forward to 'writing' this. A recipe as well...hmmm. Good that you have allowed a lot of time. But dear, where is the 6-ingredient express recipe? Loved reading your (Corny) memories not to mention the rules for the event. hmmm... where is that exclamation kye? Ok, promise will be better with my entry. No puns, no smilies, no "..." and no !!!. If only they applied these rules to the blogosphere. Sweet Memories. It was nice reading the post. Will try to dig out my past and find something the way you are asking for. Beautiful post! A great theme for an event. i always seem to live in the past since my mom passed away.. seems unreal sometimes, the past & the present... sigh. There are so many things, so many memories & tears most of the time. 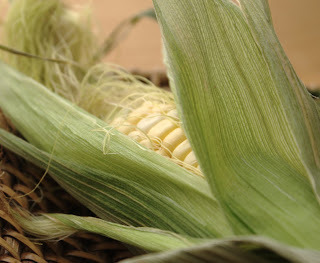 Love the picture of medha chewing on the corn:-) thats the way to go girl. You rock dear. Thats a wonderful event and count me in ! 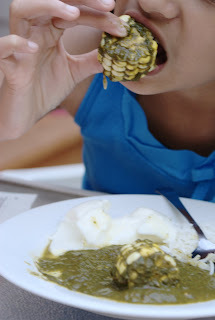 Love the pic of MEdha sucking on the cob. Pure indulgence with pure innocence ! 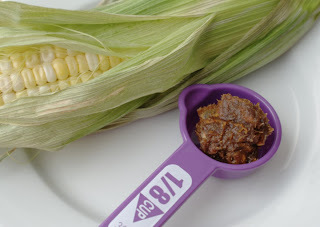 Hey Manisha, reminded me of Rishipanchamichi bhaji, that too had cobs and was patal. Do you make it or know the recipe? As an aside, I was in the office at 09-09-09 09.00AM, so guess what? I had 9 raisins on the dot at 9. And I think I have 10,OK,maybe 2 for you, though it'll be hard for me to stay away from the exclamation marks! I think you extended the date to 31st Oct? 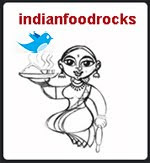 I posted this (http://mydiversekitchen.blogspot.com/2009/10/muthusaram-traditional-savoury-snack.html) on the 31st. Am I too late? Does this post qualify for IFR:Memories? am I late or can I still send my entry by tonight??? Preeti, I've been swamped with work and have had no time to even consider a round-up. Please send in your entry as soon as possible, if you haven't already! Life happens. Hang in there. Made this dish.. well, kind of. 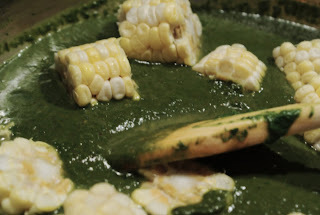 Just basic tadka onion tomato and spinach with corn in pressure cooker. 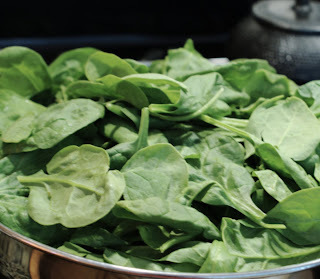 Spinach does go very well with corn and it's fun to slurp the juices from the corn cobs. yum!